Form FTB3580 or the "Application And Election To Amortize Certified Pollution Control Facility" is a form issued by the California Franchise Tax Board. 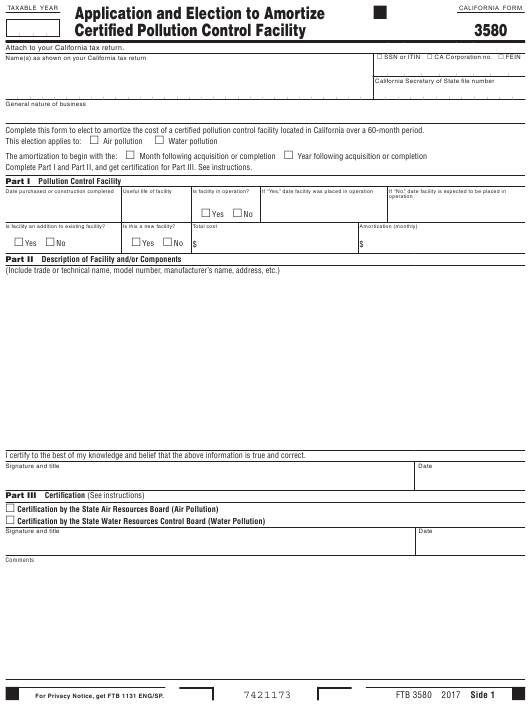 The form was last revised in January 1, 2017 and is available for digital filing. Download an up-to-date Form FTB3580 in PDF-format down below or look it up on the California Franchise Tax Board Forms website. Attach to your California tax return. Complete this form to elect to amortize the cost of a certified pollution control facility located in California over a 60-month period. Complete Part I and Part II, and get certification for Part III. See instructions. Is facility an addition to existing facility? Is this a new facility? I certify to the best of my knowledge and belief that the above information is true and correct. property after December 31, 1975.
original use of the property begins with you after this date. or not the use corresponds to your current use of the property. definition of amortizable basis below. month following the date in which you completed or acquired the facility. facility is fabricated by you, the cost of labor and materials. as 15 years is to the facility’s total years of useful life. depreciated over 20 years, the useful life of the facility. additions or improvements after the amortization period begins. amortized, for determining gain, of a certified pollution control facility. amortization. Keep the copy for your records. pollutants, contaminants, wastes, or heat. total operating costs of such plant or other property. the copy for your records.